Heat oven to 375°F. Rinse spinach with cold water to separate; drain thoroughly. In small bowl, mix mozzarella, cottage and Parmesan cheeses. In 10-inch skillet, cook beef and garlic over medium heat 8 to 10 minutes, stirring occasionally, until beef is brown; drain. 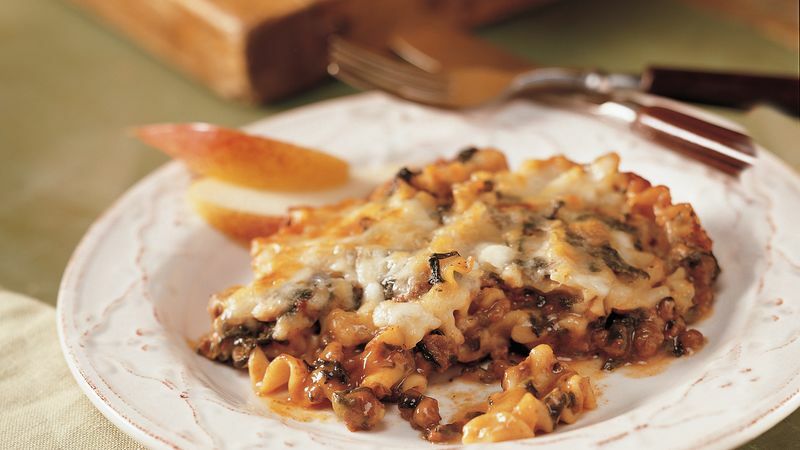 In ungreased 2-quart casserole or 11x7-inch glass baking dish, mix beef mixture, spinach, uncooked Pasta, Sauce Mix and hot water. Spoon cheese mixture evenly over top. Using paper towels to blot the spinach after you drain it is a good way to absorb any remaining moisture so the mixture won’t be too thin. No fresh garlic? Use 1/8 teaspoon dried minced garlic instead.